This work evaluates investments in discount certificates as an alternative to stock investments. It gives general information on the construction of discount certificates and the markets they can be traded in. In Addition, it describes and compares the opportunities and risks of stock investments and investments in discount certificates. It evaluates the development in value of both investments in different market environments. Using a fictive example, it shows that discount certificates outperform stocks in most market situations. The paper provides strategies for investments in discount certificates and evaluates them. Diese Arbeit bewertet Investitionen in Discount Zertifikate als Investmentalternative zu Aktien. Sie gibt unter anderem einen Einblick in die Art und Weise wie Discount Zertifikate aufgebaut sind und in welchen Märkten sie handelbar sind. Zusätzlich beschreibt diese Arbeit die Chancen und Risiken die mit einer Investition in Discount Zertifikate und vergleicht diese mit einer Aktienanlage. Dabei vergleicht sie die Wertentwicklung beider Investment-Formen anhand von verschiedenen Marktszenarien. Anhand eines theoretischen Beispiels wird aufgezeigt, dass in vielen Szenarien Discount Zertifikate besser abschneiden als Aktien. Schließlich werden verschiedene Investment-Strategien für Discount Zertifikate bewertet. Roman Schmidt wurde 1985 in Mannheim geboren und hat 2008 sein Studium zum Diplom Verwaltungswirt beendet. Sein Studium zum Master of Business Administration an der Hochschule für Ökonomie und Management wird er 2011 abschließen. Er beschäftigt sich bereits seit 2003 mit diversen Anlage und Finanzprodukten. Seit 2007 widmet er sich mit dem Thema Finanzderivate und hat sich in diesem Kontext intensiv mit den Discount Zertifikaten beschäftigt. 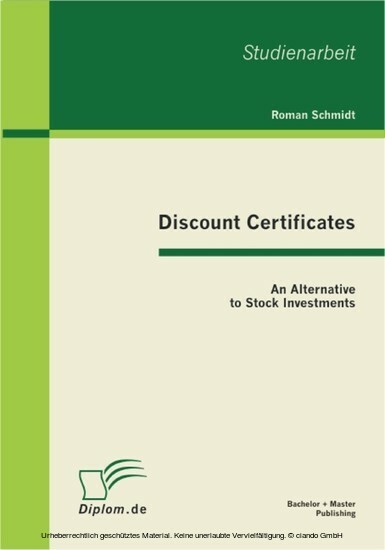 Text Sample: Chapter 3, Differentiation of Discount Certificates and stocks: 3.1, Opportunities and risks: DCs and stocks expose the investor to certain opportunities and risks. Since the DC is derived from the stock (underlying), some are similar. However, there are certain opportunities and risks, which apply only to the DC. A stock investment offers two ways of making a profit. The first is appreciation. An investor can buy a stock at a certain price and sell it at a much higher value. The difference resembles the profit. The second is dividends paid. A stock owner is entitled to a share of the profit of the particular company of which he owns the stock. If the company is profitable the investor receives a certain amount of money every year - called dividends. Stock investments also give voting rights to investors, which enables them to influence the company's way of doing business. As mentioned in Chapter 2.1 the DC does not pay dividends. So the only way of making a profit is selling the DC back to the issuer at a higher price than the investor has bought it. The sale either happens automatically when the DC matures, or during the maturity. The issuer sells the DC at a discount, which enables to investor to buy the underlying stock at a smaller price. At the end of the maturity the value of the DC equals the value of the stock or cap. So the investor posses the chance to make a profit even if the underlying stock does not performs in a positive way. The discount adds to profit in a positive market scenario. In addition, the investor can use the saved money to buy other investment products, e. g. DCs with a different underlying stock. Chapter 4 describes the situations in which a DC is more profitable than a direct stock investment. The economic risk refers to the 'risk associated with the overall health of the economy in the locality the investment is made'. For a stock investor the economic risk consists only of the uncertainty about the development of the economy the respective company is located in. If the company performs poorly the value of the underlying stock drops resulting in a loss for the investor. In Addition, expected dividends may not be paid. The same is true for a person investing in DCs. In addition, the investor interested in buying a DC has to consider the health of the economy in which the issuer operates in. DCs are unsecured bonds. This legal characteristic exposes the investor to the credit default risk. The investor may realize a total loss of his money invested in DCs irrespective to the performance of the underlying. If the issuer of the DCs files bankruptcy, the investor will only be entitled to a small compensation according to value of the issuer after it has been liquidated. The default of Lehman Brothers in 2008 is a prominent example for this risk. The foreign currency risk describes the risk implied by a change of the exchange rate between two currencies (Organisation for Economic Co-operation and Development. If the investor (located in the Eurozone) buys a stock or other financial product in another currency e.g. Dollar, then the value of the investment can change only due to a change in the exchange rate. If the Dollar decreases in value compared to the Euro, the investor makes a lost on his investment even if the nominal value of the financial product has not changed. A person invested in DCs with an underlying of stocks denominated in a foreign currency, is exposed to the same risk. However the mechanism works in both directions, therefore an investor may use a current weakness of the foreign currency to buy DCs. The currency exchange rate will then work as leverage for the investment. The same chance is also implied in an investment in stocks (denominated in a foreign currency). An investor interested in DCs faces the problem that the issuer of a DC may quote unfavourable prices. As explained in Chapter 2.2 the issuer of a DC is virtually involved in every transaction of a DC. Wilkens, Erner, and Röder describe the order flow hypothesis which states that the issuer of a DC orientates the pricing of a DC in accordance to the life cycle of the product. The issuer does not quote a fair price of the DC, but a price according to the risk of redeeming the DC in stocks. As a consequence the price of a DC differs more from the fair price the longer the maturity time is. In addition, Baule, Entrop, and Wilkens point out, that the position as a market maker enables the issuer to realize a margin higher, which is higher than the margin of the components of a DC. The investor is in danger of being put into a disadvantageous position by the market power of the issuing institute. The fair value of the DC is also determined by its legal structure. The issuer incorporates 'its own risk in the payoff structure'. However, for an investor it is also necessary to evaluate the value of a DC not only through evaluating its components, but also to take the transaction costs of reproducing the DC in consideration. Depending on the structure of a DC the transaction costs of buying the single components of a DC individually may exceed the disadvantages in the pricing of a DC by the issuer. The investor, therefore, has always to consider the both aspects when thinking about investing in DCs. Although the pricing of a DC may be disadvantageous compared to its components, it may still be a better deal than buying them individually (e. g. when considering transaction costs). An investor in stocks participates in the profit of the respective company by payments of dividends. A DC does not pay dividends. So the only way for the investor to make profit with the DC is by selling it at higher price than he purchased it. If the investor holds the DC until maturity, he will risk to have made less profit than investing directly into a stock. This situation occurs, when the combined profit of value increase and dividends of the stock exceeds the increase in value of the discount certificate including the discount. In Addition, a change in the expected dividends paid also influences the price of the DC during the time of maturity. If the amount of dividends paid increases the value of the zero-strike-call drops, thereby decreasing the value of the DC. So an increase of dividends may result in a loss for an investor planning to sell the DC before it matures. The tradability of DCs represents a special risk to potential investors. As described in chapter 2.2, the issuer is virtually the only the only possible trading partner for an investor of DCs. However an issuer may decide any time to stop taking the role as a trading partner. It can stop quoting bids and asks at the stock market at any point. The OTC-trading may be stopped due to a change in business policies or a lack of liquidity of the issuing institution. An example for such an incident is provided by Commerzbank which declard that it would not act as a market maker for several certificates with an US-bank-share as underlying during the days of the Lehman Brothers bankruptcy. By investing into DCs the investor has realize that he risks holding illiquid assets. Although a stock may become harder to trade as a company performs very ill or has to file bankruptcy. The stock investor will have always the advantage of having more than one potential trading partner. This reduces the risk of not being able to cash in (even at a low price) when needed.